Are you planning a road trip through the Canadian Rockies and don’t know where to start? Our detailed suggested itinerary includes all the incredible places you can visit, budget & road trip tips and our comprehensive guides and articles that will help you to make the most of your time in Canada. As locals, we provide you only with the best insider tips in one place. 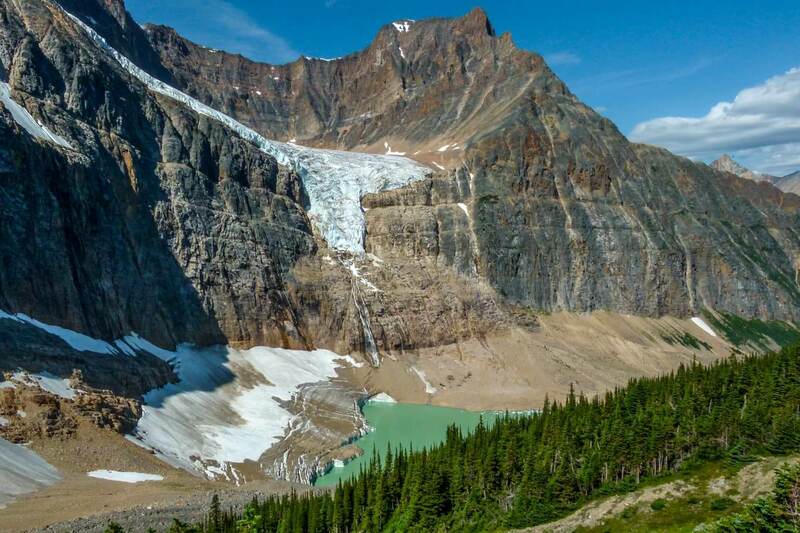 Taking a road trip through western Canada will bring you closer to the real wilderness. 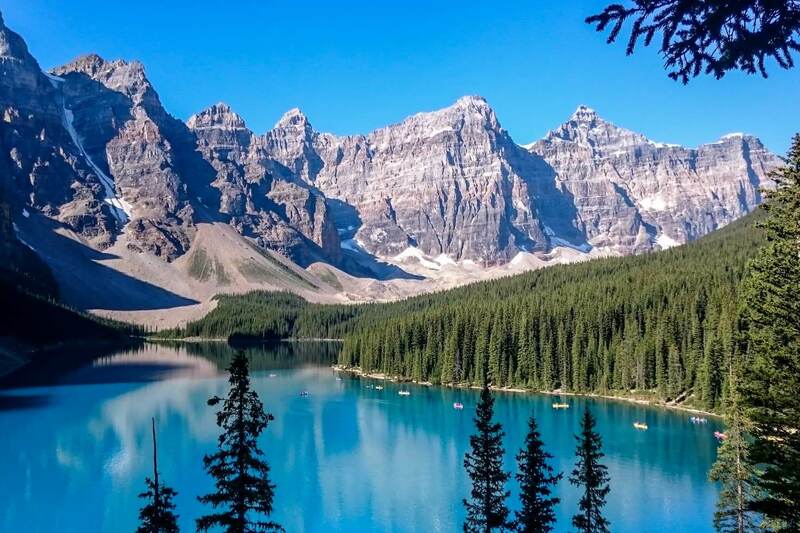 The Canadian Rockies are the southern extent of the only real wilderness in North America. That means you might meet more wildlife than people. This itinerary starts in Calgary, where we lived, and finishes in Vancouver. Alternatively, if you’re starting a road trip the other direction, just read from the bottom of the post up. 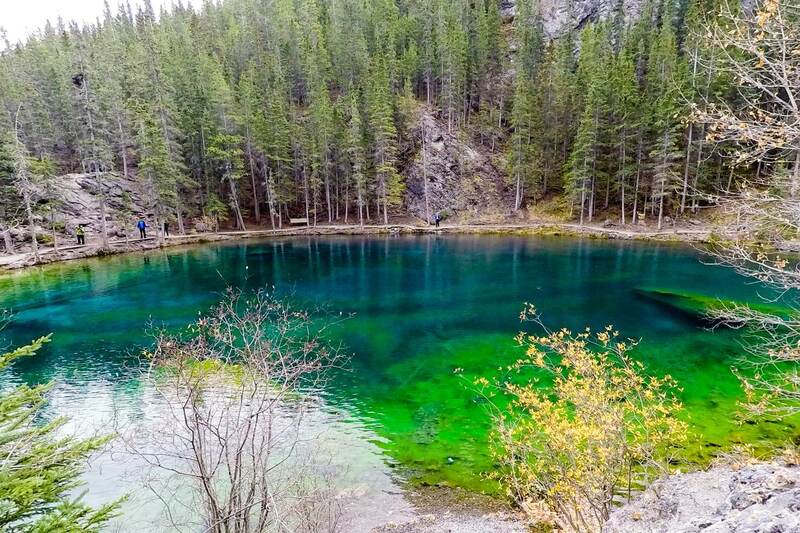 Following the below road trip itinerary, you will have a chance to visit 10 interesting places – Calgary, Canmore, Banff, Lake Louise, Yoho National Park, Jasper, Kamloops, Whistler, Squamish, and Vancouver. 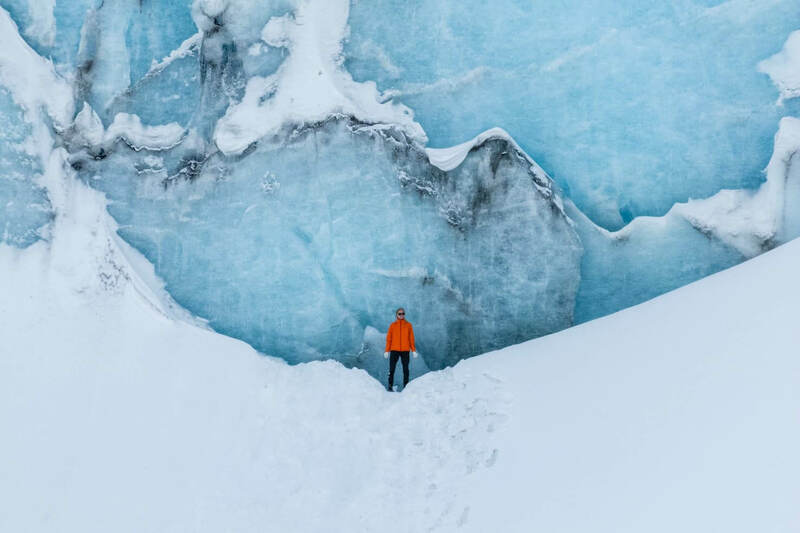 During the 14 days, you will get to enjoy mountain fresh air, blue lakes, frozen glaciers, historical buildings, desert, and wildlife and create lifetime memories. Prepare to drive between 1500 and 2000 km. Canadian roads through the mountains are wide and almost straight compared to European roads in the Alps or other mountains. You will spend somewhere between 25 to 35 hours sitting in your car in two weeks. But trust us, all of this will be worth it. It depends on your preferences but you will need around CAD 3500 – 6200 for a couple for two weeks (not including attractions). If you are willing to try road trip in campervan you might save even more money. With Smile Campervans you can save CAD 2000 on your hotels. If you cook for yourself and minimize paid attractions you can get closer to CAD 3000. There is a big chance that you will encounter some animals on your trip. Give them space and learn how to react when you encounter a bear or elk. It’s also worth knowing which time of the year you should visit Canadian mountains. Calgary is the closest airport to the Canadian Rockies. It’s a young city, only little more than 140 years old since Europeans settled here. It has the most sunny days in Canada – 333 days a year! Chances of good weather are very high. Calgary’s city road system is well designed to get you fast to your destination and you can rarely see congestions (unlike in Vancouver). If you are staying in a tent or camper, the campgrounds are at the city borders. Similar to other cities you won’t find many campgrounds close to downtown. Calgary West Campground is located near Trans-Canada Highway. If you prefer something cozy close to downtown, try River Wynde Executive Bed & Breakfast. In the morning you will take Highway 1 to Canmore. From downtown, it is about 20 minutes to the city limits. Once you will get out on a clear day you will already see peaks of the Rocky Mountains. Drive to Canmore will take about an hour. Canmore has options for every budget. Hotels are usually cheaper than in Banff, so you might consider staying in Canmore and drive to Banff every day. It’s only 20 minutes by car. Camp at Wapiti campground or stay at best rated Canmore Rocky Mountain Inn. From Canmore, get back on the Trans-Canada Highway. As you exit the town you will have to stop at park entry booth to purchase Parks Canada Discovery Pass (136 CAD). You have an option to purchase daily or yearly pass, but since you’ll be visiting national parks for more than a day, a yearly pass pays off. Our itinerary includes 8 days spent in National Parks. 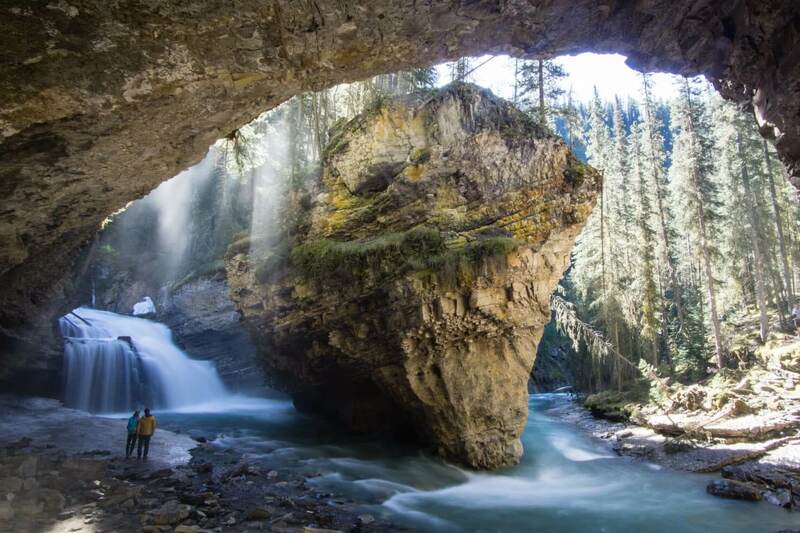 We compiled a huge list of 100 things that you can do in Banff National Park. There’s plenty to choose from. 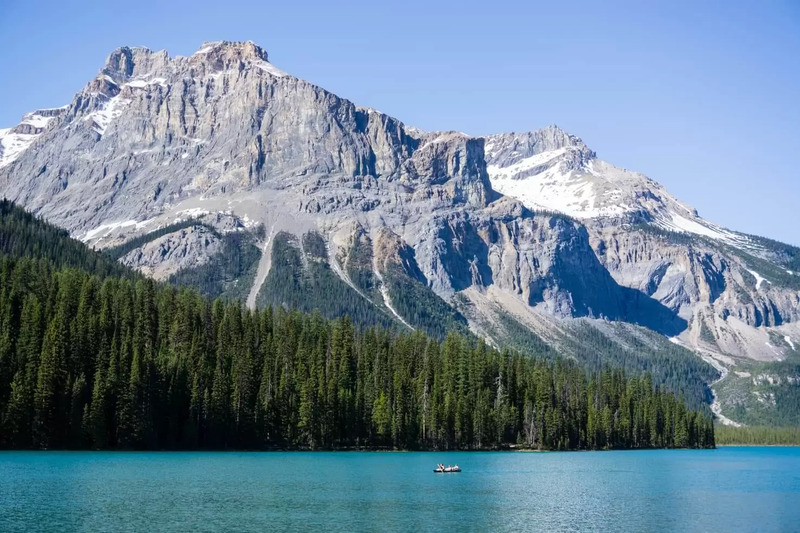 You may like an easy relaxed day on a boat or hike up the Tunnel Mountain for panoramic views of Banff and surrounding mountains. Staying in Banff will be one of your biggest items on your budget. The most expensive stays start at 300 CAD per room. There are some budget-friendly options. Bring your own tent and stay in the campsites with warm showers which start from 27 CAD. Reasonable prices for hotels start at 120 CAD, you can try best-rated accommodation in Banff Mountain View Bed & Breakfast. Surprisingly chain restaurants aren’t overpriced compared to the rest of Canada. Our tip – go local! You can find great food in Balkan Restaurant or The Maple Leaf. Our favourite restaurant in Banff, which is also in Vancouver and other cities, is Old Spaghetti Factory. Stock up on food supplies in Banff, the next bigger grocery store is 5 days away in Jasper. 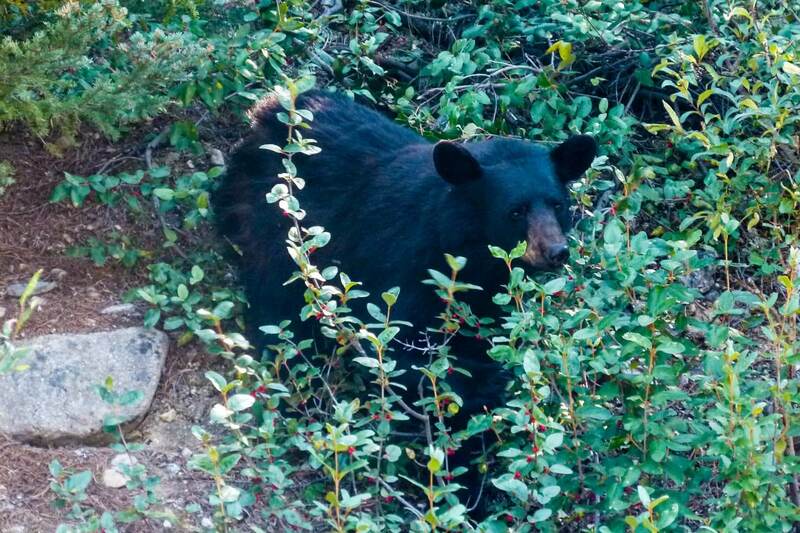 Leave Banff early in the morning and you’ll have a bigger chance of seeing wildlife. Heading west from Banff, after about 10 minutes of driving, you will take the exit to 1A/Bow Valley Parkway. You will stay on this road all the way to Lake Louise. Driving itself takes only 1.5 hours but you will definitely want to stop for some great pictures. You should arrive in Lake Louise in the evening. Bow Valley Parkway is a wildlife corridor and many species of animals can be seen along the road. Most common are elk, sheep, mountain goat, bear, and wolves. Have your camera ready and drive slow. You can make a stop at Johnston Canyon, it’s a nice and easy walk to several waterfalls, read our post about frozen Johnston Canyon in winter. If your day extends, you have a few options to stay overnight along the road. Halfway on the road at the Castle Junction, you can stay at Castle Mountain Campground, hostel or Castle Mountain Chalets. If you arrived in Lake Louise the evening of day 5, you probably had a chance to see Lake Louise. If not, wake up early to beat the crowds from tour buses and go for a morning stroll. There’s an easy hike to the Lake Agness teahouse, you can see the lake, hotel and even ski resort on the other side. And of course, after Lake Louise, don’t forget to visit Moraine Lake, one of the most beautiful lakes in the Canadian Rockies. Lake Louise has many hiking trails which you can find in our post. You can go biking on Great Divide Trail or take a gondola on the other side of the valley where the ski resort and hiking trails are located. You can stay at Mountaineer Lodge, as a good value option or Lake Louise Campground. There are not many accommodation options, it’s just a small village after all and most people choose to stay in Banff. 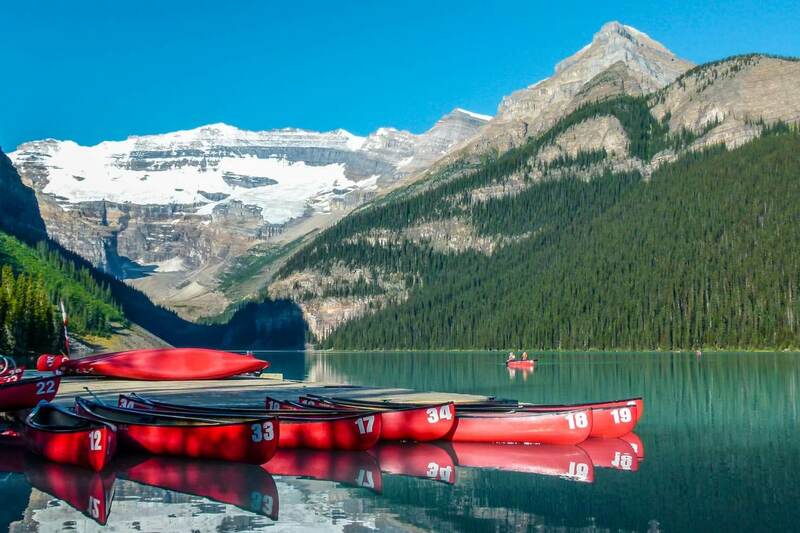 Stay two nights in Lake Louise area, as you will see, the next day is a little detour to Yoho National Park. It will save you half an hour on your longest day in a car on day 8. 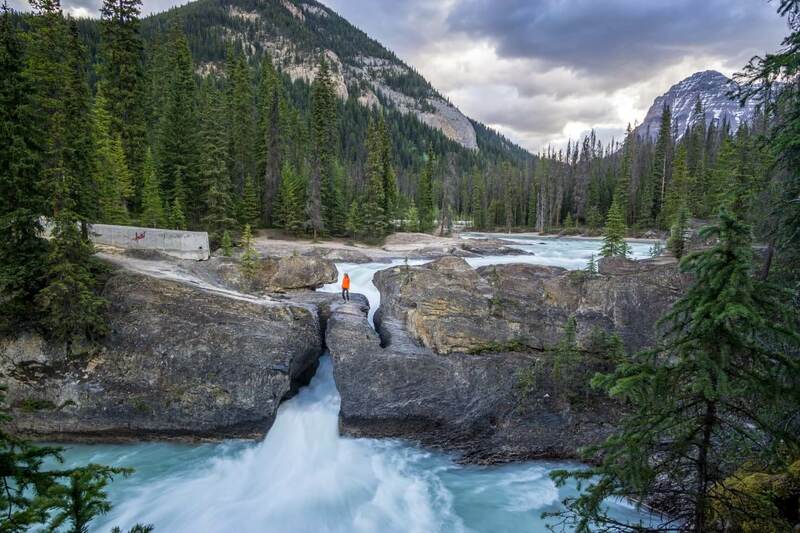 Leave early in the morning and take a small detour to Yoho National Park. You will take Highway 1 towards Golden. 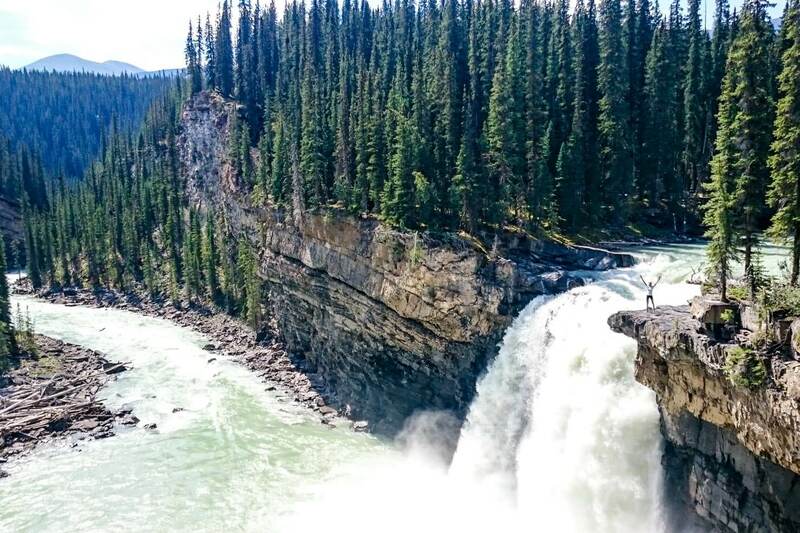 The longer ride is only in case you want to see Wapta Falls. The center of Yoho National Park is a village Field. You can stay at a picturesque lodge at Emerald Lake (350 CAD/night) or Lodge at Lake O’Hara (700 CAD/night). 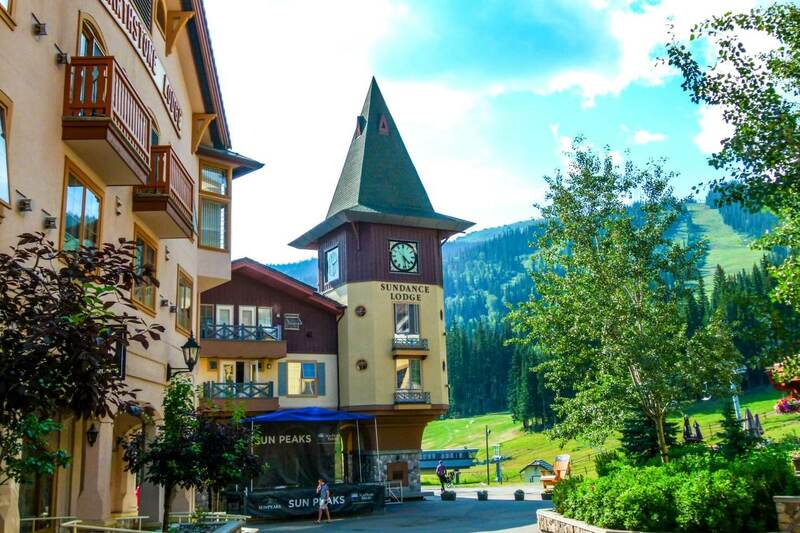 Our suggestion is to try one of the guesthouses that are located on the hillside of the village or head back to Lake Louise (it will save you some time for the next day drive). Either you start from Field or from Lake Louise prepare for a long and intense driving experience. But the ever-changing scenery will make up for it. Don’t forget to fill up in Lake Louise, there is only one gas station on Icefields Parkway with 50% markup. From Lake Louise follow signs for Jasper. After only a minute on the highway, you will exit it to Road 93. 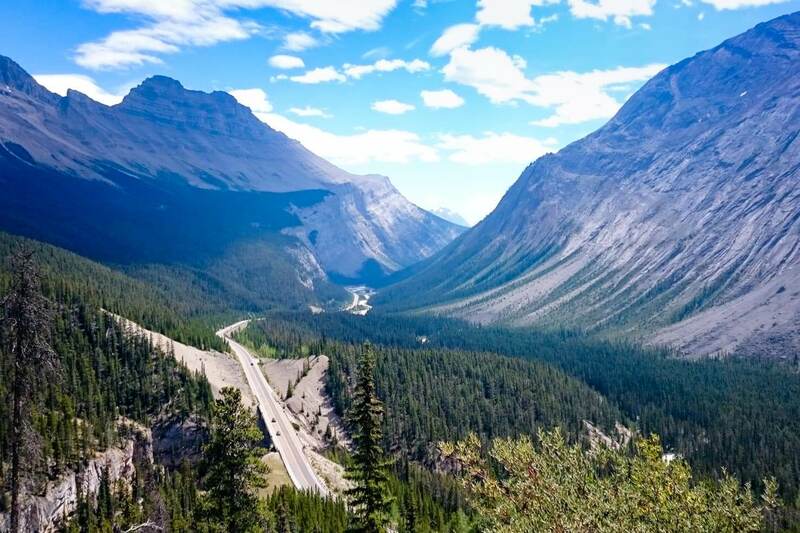 Read our detailed guide about Icefields Parkway to get a better picture what you can expect. 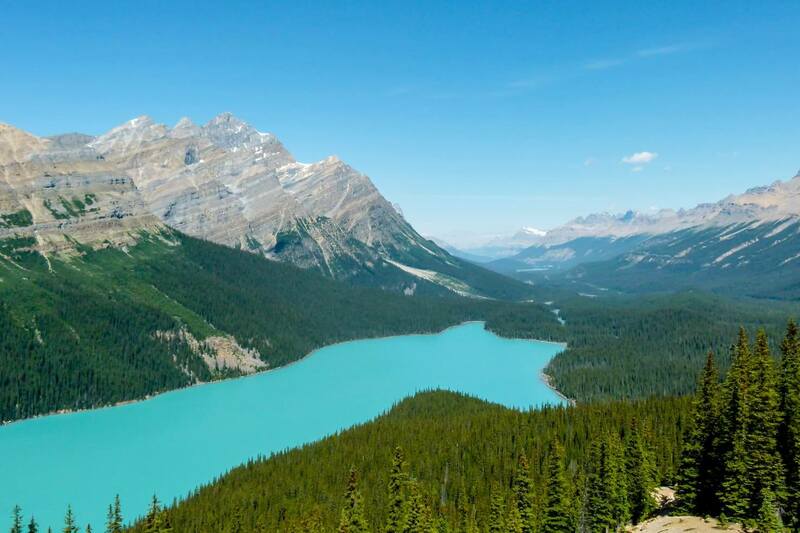 After a good sleep and digesting all natural elements from the previous day, you are ready for some stretching in a form of a hike or bike in Jasper. 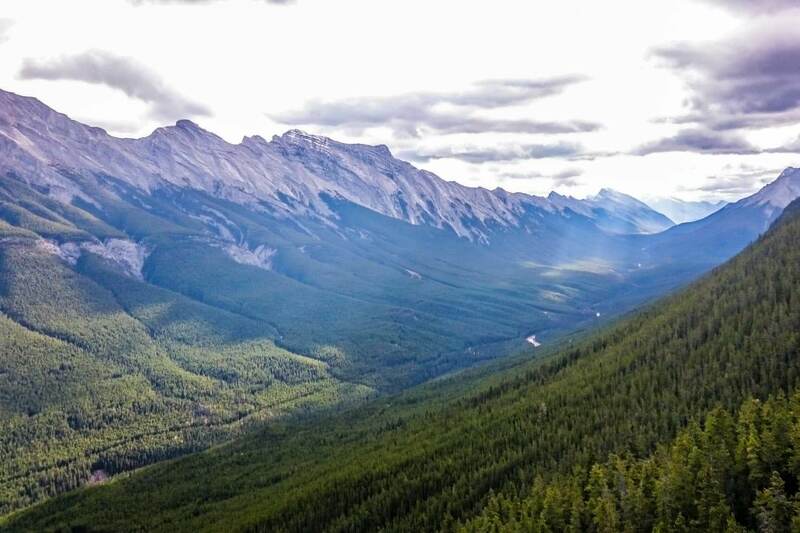 You can find some inspiration in our post which hikes to do in Jasper. If you are coming to the Canadian Rockies for outdoor activities, such as mountain biking, stay longer in Jasper instead of Banff. If you truly love wilderness and nature, Jasper is the place to be. Hotels in Jasper are smaller than in Banff but there are a lot of family run B&B style houses. Also, compared to Banff prices are cheaper. You will also find many nice campgrounds and chalets on lakeshores. Try Pyramid Lake Resort or Wapiti Campground. You may even notice the change in types of rock formations and thickness of the forest. The biggest change is in the desert like Kamloops Valley. 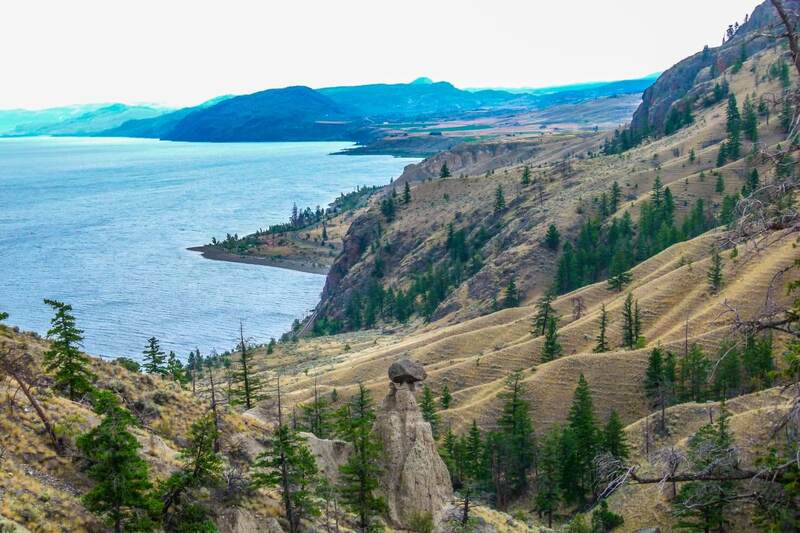 Kamloops has the warmest summer in Canada. Kamloops is the biggest city in central British Columbia and it has many accommodation options. You can stay at Knutsford Campground or as a family in the Plaza Hotel in downtown. You can restock your food supplies for the last part of your trip. If you find the time, go for a short hike to either Peterson Creek Park or Kenna Cartwright Park. Bring water with you, especially during sunny days as it gets very hot. If you don’t want to spend extra time exploring Kamloops, take the exit towards Vancouver and follow Highway 1. The first half of your day might be quite warm as you will drive through Nevada-like scenery on your 100 km towards Cache Creek. From Cache Creek follow signs to Lillooet than continue to Whistler. Whistler has a world class skiing resort and you will find all types of accommodation. But staying in Whistler is even more expensive than staying in Banff. Book Aava Whistler Hotel for better value or use Parkbridge Camping campsites. If you don’t want to stay in Whistler overnight, we recommend driving another 40 minutes to Squamish where prices are more budget friendly. As an example, Howe Sound Inn & Brewing Company costs about a third of the prices in Whistler. If you stayed in Squamish and you like biking don’t rush from there and go for a ride on 200 km of single-tracks they have around town. If biking is not for you, drive to Vancouver. It is only about an hour and a half from Whistler and 40 minutes from Squamish. 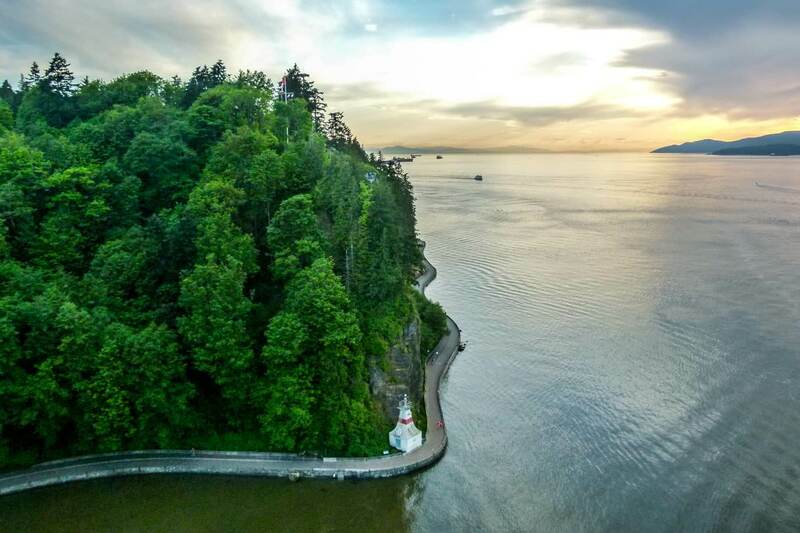 Once you arrive, you will see why Vancouver is one of the top 5 places in the world to live in. Nice scenery, mountains, parks right at the city limits, ocean, and beaches. Good locations to stay in Vancouver are downtown or North and West Vancouver. North Vancouver Hotel with swimming pool just outside Capilano Valley and close to Lions Gate Bridge can be your budget option. 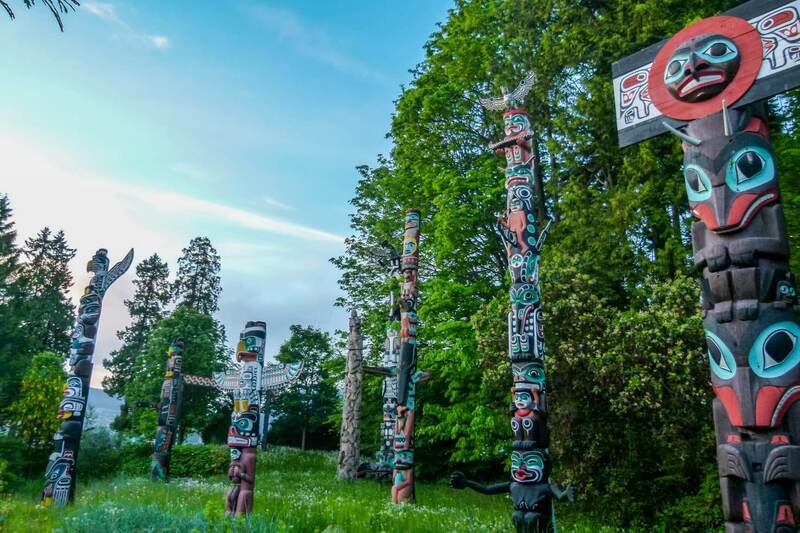 Campgrounds are mostly located on the outskirts of the city but Capilano RV Park is almost in the city center. 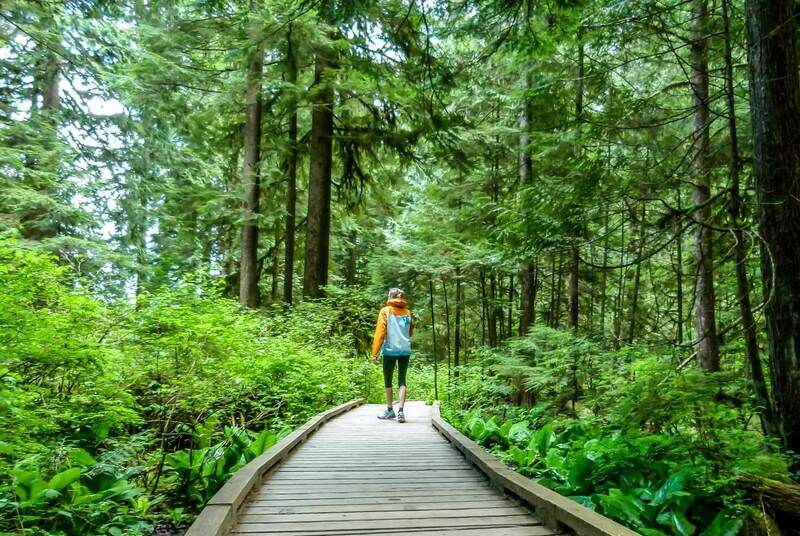 If you have more time and want to continue on Vancouver Island, we have a great article for you: 32 outdoor things you can do on Vancouver Island. If you are flying out from Vancouver, have a safe trip home. We sincerely hope that our road trip itinerary through Western Canada will help you plan your great road trip. What would you like to visit the most? Share with us in the comments and let us know if you have any questions. Would you give me advise on this move?? I would really appreciate if I can chat with you and ask you a few questions. Take care and regards from the city of Madrid! Hi Laura, how exciting! I’m happy for you. Shoot me an email and I’ll help where I can. I can’t express how much l enjoyed reading your post, as I will be on a one month road trip to western Canada starting in Calgary. I will be doing your 2 weeks as per your post and I am wondering I still have another Two weeks to discover some where and was thinking traveling to the Alaska to see this part of the world. Would you have any idea where to go or a plan for this kind of trip from Vancouver. Hi Alex, nice to hear you enjoyed the post. I would recommend visiting Vancouver Island and Sunshine Coast instead of driving to Alaska, it’s a very long drive and you will be driving a lot anyway. But we haven’t done it so I really can’t say much about it. Just so you’re aware – the road to Moraine Lake will most likely be still closed when you visit so you won’t be able to visit the lake. And Lake Louise will be partially covered with ice. 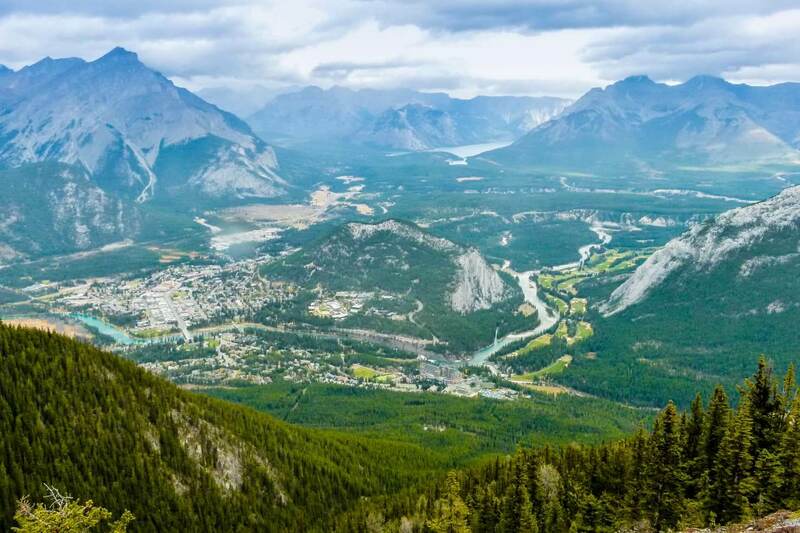 But there is so much to see and do in Canmore, Banff and Jasper that you can spend more time in these places. Including all of this, one month is an ideal length in my opinion. I am so excited to find your post. My husband and I are thinking of doing this exact trip this summer! Hi Heather, that is fantastic! You will have a great time. Let us know if you have any questions. I’ll be doing a similar trip in July this year and have got some great tips from your blog. My partner hates being tied down to a destination at the end of a day is it so busy we would struggle finding accommodation as we go or booking a day in advance? have enjoyed reading all your ideas. Hi Fran, I completely understand, we also like to book as we go. Since July and August is the peak season, locations such as Banff, Lake Louise, Jasper and Whistler might be fully booked (even campgrounds). So if you’re planning to stay in these towns, I would suggest booking as soon as possible. Or alternatively, you can stay in Canmore instead of Banff and in Hinton instead of Jasper, depends on your preference and your budget. 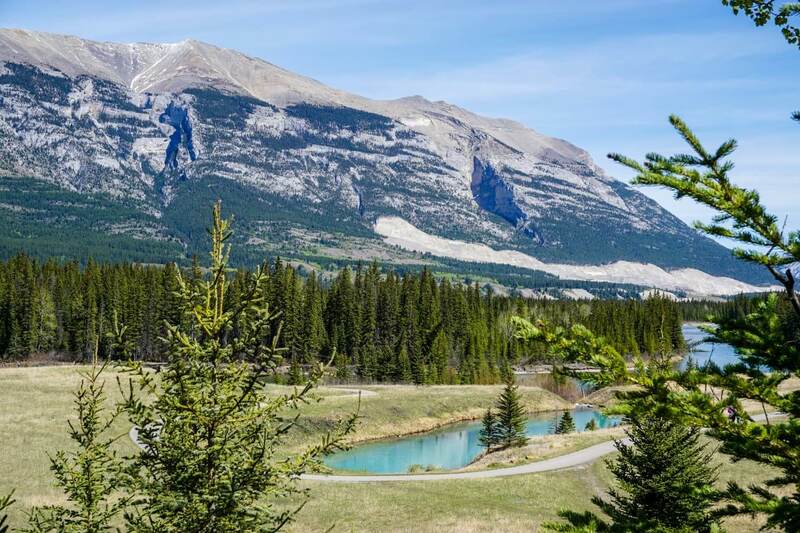 We usually stay in budget friendly accommodations so Canmore and Hinton are great, we didn’t have troubles to book a day in advance during summer. A few sisters and myself are thinking about flying from Ontario to Vancouver the summer of 2019 for a family event near Williams Lake BC. After reading your suggestions, I’m thinking of making this into a road trip and flying back from Calgary. I’m glad to hear that Lori. Sisters road trip sounds amazing. I have been thinking for few years to do this road trip and Now I will plan to go for it this fall of 2018. If can send any extra hints you have would greatly appreciate. In January I did a Hawaiian road trip for 5 weeks to explore The 2 main islands, the cost was Round 7500 in total. Fall is a great time for a visit. I believe we put all the great tips in the post but if you have a specific question, please ask. Enjoy your trip! 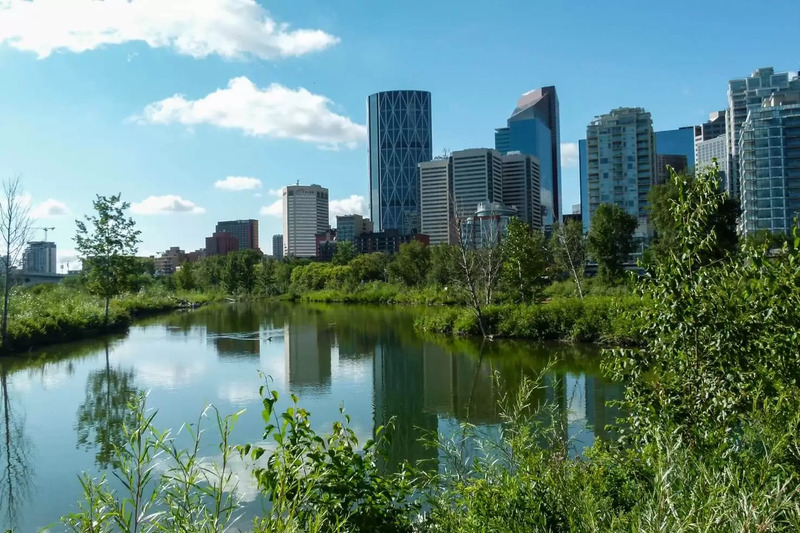 Fantastic article, we are doing this trip after 8 nights in Toronto arriving Calgary 27th July arriving vancouver 6th August for 3 nights then fly home to Ireland. Very helpful, article, we’ve booked a night in Cochrane after leaving Calgary then a night booked in Golden but I’m wondering now if the 2nd stop is a wrong decision as we’d like to go to Jasper. Any thoughts would be welcome. Glad to hear that Karen! If you’re driving from Calgary to Vancouver and you have July 27th – Aug 6th, I would suggest going Canmore, Banff, Jasper etc. But if you’re flying to Vancouver from Calgary and you have more time in one area, you can go to Golden and spend there a few days. Otherwise I think that would add many km to your already long trip. Better spend more time enjoying outdoors in Jasper than driving to Golden. Hope this helps!